Turkey is known for producing some of the highest quality towels, often found in luxury spas and salons alike. 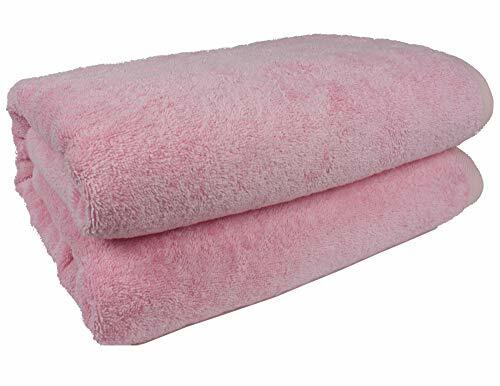 These towels are as absorbent as traditional towels, but unlike many others, these will actually get softer and softer with each wash. The double-lock stitched hems prevent these towels from falling apart. To ensure years of vibrant color and softness, these bath sheets are never bleached. Even the whites are dyed white through a VAT dyeing process. Color coordinate to your existing bathroom theme, or simply choose the color that fits you best. Care Instructions: For maximum color retention and softness, do not use any bleach when washing these towels. 100% Money Back Guarantee! SALBAKOS stands behind its products! If you are at all unsatisfied, simply let us know and you will receive a full refund - no questions asked! ECO-FRIENDLY AND HIGHEST QUALITY - OEKO-TEX Certified - all cotton is grown and all manufacturing processes use no harmful chemicals. Manufactured in an ISO-9001 mill for incredible quality control. See pictures for copies of certifications and below for more on OEKO-TEX. MONEY BACK GUARANTEE - American Pillowcase stands behind their products and offers a hassle free, no questions asked return process.